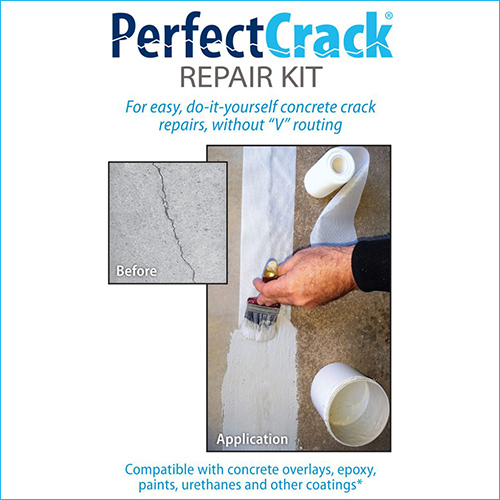 The PerfectCrack® Repair Kit includes everything you need to repair and waterproof concrete cracks and seams. IA concrete repair kit that doesn’t require special skills, knowledge or tools to install? PerfectCrack is the right repair kit for the DIYer who wants to achieve professional level results. The kit includes everything you will need to waterproof and repair any concrete cracks or seams. Is easy to apply when repairing concrete cracks. There is no need for V routing. Is compatible with a wide variety of coatings and paints including urethanes, epoxies and concrete overlays. It is important to ensure that the surface is clean and dry. Remove dirt, bio-matter, loose particles, grease and wax using warm water. You may add a few drops of dishwashing liquid if necessary. If working on epoxy, polyspartic or urethane surfaces, you will need to wipe down the surface with a de-natured alcohol after lightly sanding it. PerfectSpackle is a waterproof and flexible spackling paste that is used to fill seams, cracks and roof flashings. It is a paste that can be made on site by mixing TrueGrit and PerfectPrimer. The paste can be applied to ¼” cracks using a blade or your finger. Cracks that are wider than ½” should be filled with TrueGrit before applying a PerfectSpackle as a thin layer of top coat. You can use PerfectSpackle to repair hairline cracks in concrete without using Polytex fabric. For cracks wider than ½”, apply PerfectPrimer using a roller. Apply the Polytex fabric on the wet surface. Use a brush to smooth the surface of the fabric. Work from the center outward. Apply a second coat when the fabric is tacky. The finished product ought to be waterproof and flexible. This method of repair allows you to coat the surface as you please thereafter. You can coat over the repaired crack with stucco, paints, epoxies, cement etc. Do not use the PerfectCrack system to repair structural cracks or for waterproofing from the negative side.